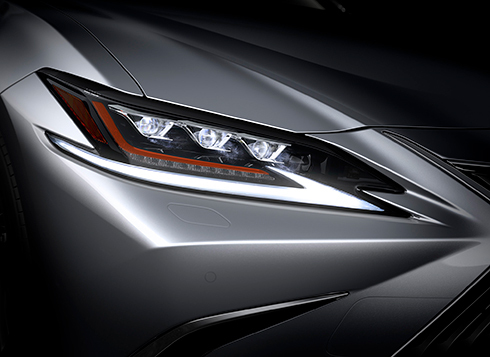 The compact 3-eye Bi-Beam LED headlamps combine a beautiful, sharply-defined design with excellent light distribution. The sequential turn signal lamps illuminate in a sequential flow from the inner side to the outside of the vehicle. 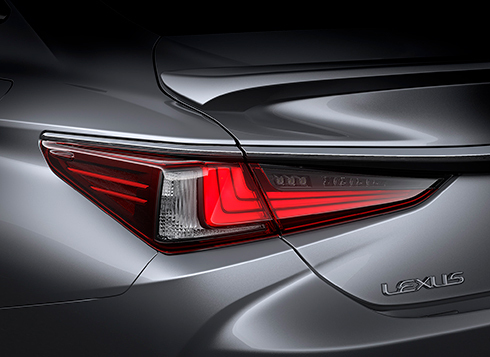 The L-shaped rear combination lamps reinforce the ES’s Lexus identity. The three-dimensional design was engineered to combine high visibility with distinctive style. 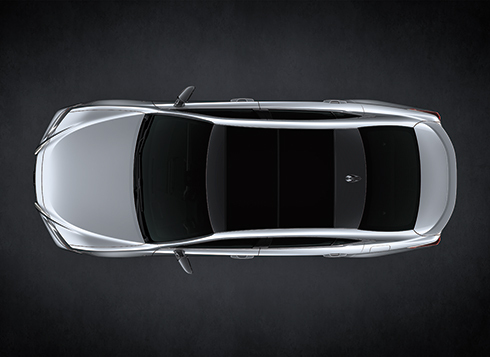 The large glass roof lets in an abundance of light, adding to the spacious airy feeling in the cabin. It has three sections: the front acts as a wind deflector when the center is slid open, the center has a power tilt and slide function, and the rear is a fixed type. For safe operation during closing, the glass roof stops temporarily in a safe position, and requires a further press of the close switch to fully close it. Even if both hands are full, when carrying the Electronic Key you can open and close the trunk lid automatically by moving your foot under the rear bumper and out again. The 12.3-inch EMV (Electro Multi-Vision) displays incoming hands-free mobile calls, audio system and other information, and coordinates the display of select information with the multi-information display integrated into the 7-inch color TFT (Thin Film Transistor) Optitron meter and the large color head-up display positioned in the driver’s line of sight. To allow the driver to concentrate on driving, the layout is designed with all controls within easy reach, minimizing the need for changes in posture or line of sight. The EMV displays information such as maps in full-screen mode without limiting the driver’s ability to access the information, even when displaying the menu and map at the same time. The interface is designed for smartphone-style operation. The cursor can be adjusted to stop following flick operation to suit the user’s preferences. Pinch-in and pinch-out operation enables continuous in and out zooming. Adopting a Pure Play layout, 7 Unity speakers with identical performance are arranged along the shoulder line which runs from the instrument panel to the door tops, effectively surrounding the cabin. 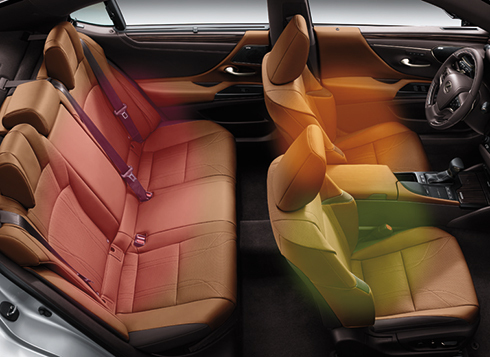 By placing speakers close to occupants’ ears so there are fewer obstructions, this layout realizes clear sound, even in the rear seats. The rich, powerful low-frequency sounds from the woofers combine with advanced sound technology to provide a crisp audio experience that envelops passengers. The front seatbacks feature a design with separate upper and lower sections to provide a continuous flow through to the console and armrest. Integrated lumbar support for the lower back helps reduce fatigue on long drives. 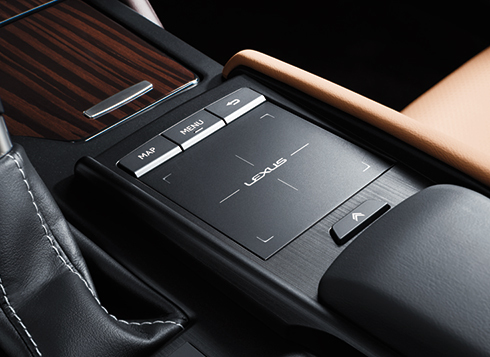 Switches control 4-way horizontal and vertical adjustments, enabling the driver and front seat passenger to tailor the optimal position to suit their physiques. 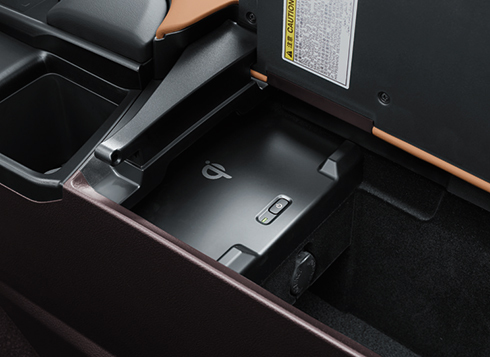 For wireless charging of batteries, simply place Qi-compatible smartphones and electronic devices on the charging tray in the center console box. 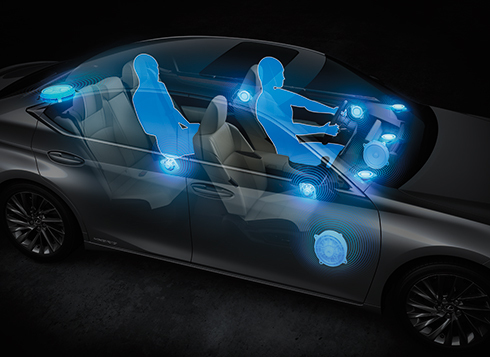 The powerful energy-efficient air conditioning system provides 3-zone independent control of the temperature in the driver’s seat, front passenger’s seat and rear seats. 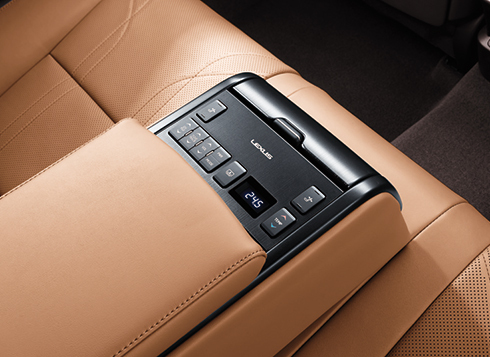 A control panel for rear seat passengers is conveniently located in the rear center armrest. 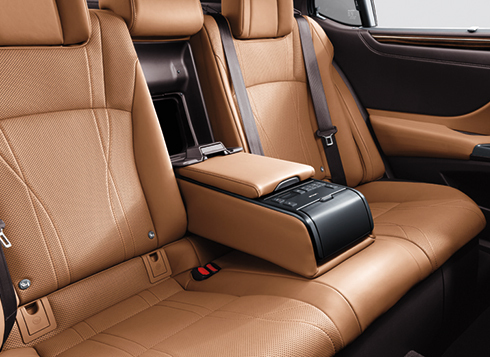 The rear seats feature a center armrest with convenient cupholders. An integrated control panel lets occupants adjust the audio system, seat recline and other settings, further enhancing passenger pleasure. 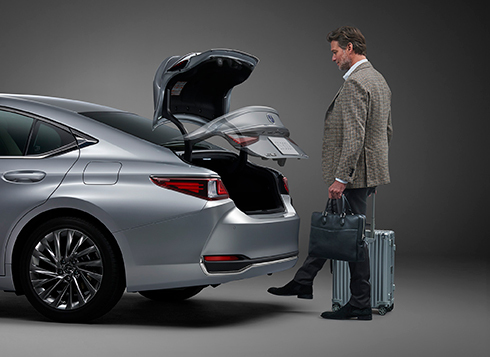 Trunk-through functionality enables the carrying of longer items that won’t fit in the trunk. 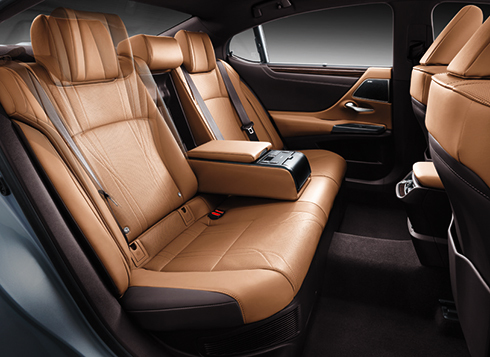 The reclining power rear seats provide up to 8° of recline to create an even more relaxing space. 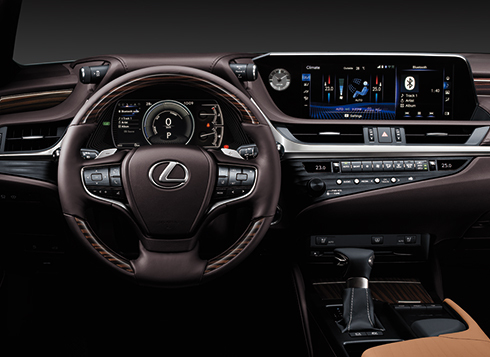 Subtle Lexus hospitality is seen in the elegant and functional design of the instrument panel and its real stitching detail. 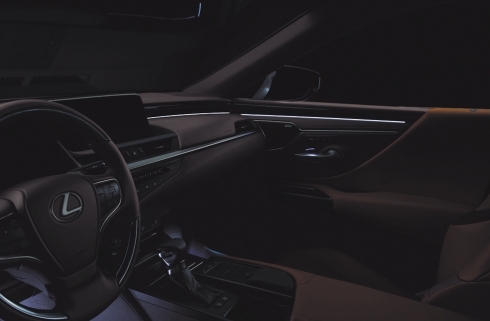 The use of LED ambient illumination to indirectly light the lower instrument panel and front and rear door trim, creates a feeling at night of being gently enveloped. The brightness can be adjusted to suit your preference. Sunshades for the rear door and rear quarter windows, and a power sunshade for the rear window provide shade and privacy in the rear seats. 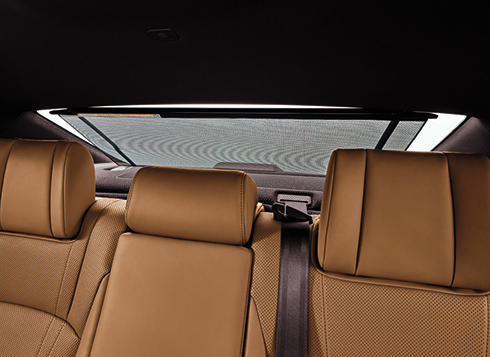 For a clear field of view when reversing, the rear window sunshade automatically lowers when reverse gear is engaged.